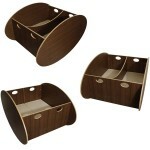 Home » Scandinavian designed so-ro cradle ~ Smooth, sleek, practical and gorgeous! The beautiful modern so-ro cradle has added a new twist to the traditional cradle. Instead of a side to side sway, the so-ro cradle has a gentle forward motion. This unique forward motion of the so-ro cradle registers in a completely different part of the brain than the traditional lateral movement, and is also often more soothing than the sideways sway which can occasionally lead to dizziness. Designed to suit infants from newborn to about 6 months of age, the so-ro cradle is a great option in the bedroom during the night or the living room during the day. The cradle is made from real wood veneer in either American walnut or European maple or white laminate on Baltic birch plywood, resulting in a cradle that would fit seamlessly into any modern home. This unique cradle is also available in a wider size for twins.